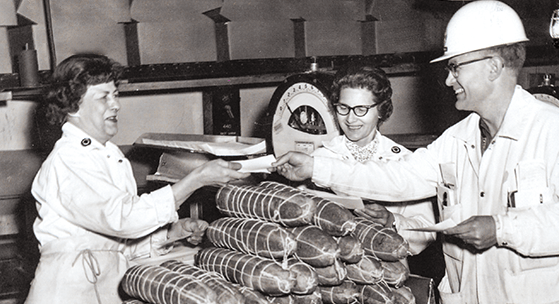 Di Lusso Deli Company has been creating the finest deli meats and cheeses since 1919. You’ll taste our commitment to unwavering quality, family tradition, and authenticity in every delicious bite. We believe in helping you find every opportunity to create, share and delight in the moments great food can provide. To live in every bite and indulge in every flavor. Although some products may not naturally contain gluten, it can be added to products when they are further processed. Gluten is used as a binder, filler, or spice enhancer. DI LUSSO® deli meats and cheeses are minimally processed and do not contain gluten. Do DI LUSSO® deli meats and cheeses contain gluten or MSG? No, all of our meats and cheeses are produced free of gluten with no added MSG. What does Black Angus mean? USDA Choice Black Angus is the highest quality beef you can find in the deli. Quality, flavor, and tenderness are typical of the beef produced from the Black Angus cattle. Which DI LUSSO® products are lowest in sodium? How long do sliced deli meats stay fresh in the refrigerator? For optimal product performance, we recommend eating sliced deli meats within 5-6 days of purchase. Is it safe to eat deli meats when I’m pregnant? While pregnant, it is always important to monitor the foods you are ingesting. Although listeriosis (a food-borne illness caused by ingesting the bacterium listeria) is not common, pregnant women are more apt to be affected by it than non-pregnant adults. This can be harmful to both the mother and the baby. In order to ensure the safety of you and your baby, it is recommended that deli meats be heated to a minimum of 160 degrees Fahrenheit before eating while pregnant. Can I freeze my deli meats? What makes DI LUSSO® deli turkey superior to other brands? We only use whole breast lobes and product without skin. Many of our turkeys are cooked in their natural juices, no water added. There are no extenders, fillers, or binders in our turkey, just breast meat. What makes DI LUSSO® deli ham superior to other brands? All of our ham products are made with whole muscles. This means that we do not include fillers in our products, but only use whole pieces. Our flavored hams are flavored with natural flavorings, not artificial. Products are real wood smoked. Each of our hams are carefully selected to be used in our products. Products are naturally low in fat. What makes DI LUSSO® beef superior to other brands? We use only USDA Choice Black Angus beef in our products. This is the highest-quality meat you can find in the deli. We only use fresh, domestic beef in our products, never frozen raw materials. How many servings are in a pound of deli meat? The FDA defines 2 ounces as a serving size in regards to deli meat. That being said, one pound of product would equal 8 servings per pound. How many servings are in a pound of deli cheese? The USDA defines 1 ounce as a serving size in regards to deli cheese. That being said, one pound of product would equal 16 servings per pound.